The Steam Holiday Sale Day 3! Were excited to announce the launch of the Map Workshop for Counter-Strike: Global Offensive. Now its easy to discover and play new maps and game modes designed by the Counter-Strike community. With the Map Workshop you can find new maps, vote for favorites and subscribe to any map or game mode that you'd like. Steam will automatically download the map, and update it whenever the author makes a change. Workshop maps can used in quickmatches, private matches through Play With Friends, or even offline with bots. Map makers can specify a wide range of gameplay-affecting settings. Stick to the standard CS formula, or create a totally new experience for players. Don't worry about trying something new or testing a unique feature because you can update your maps as often as you'd like. Players and servers that have subscribed will automatically get all new updates! You can learn more about the new Map Workshop here. 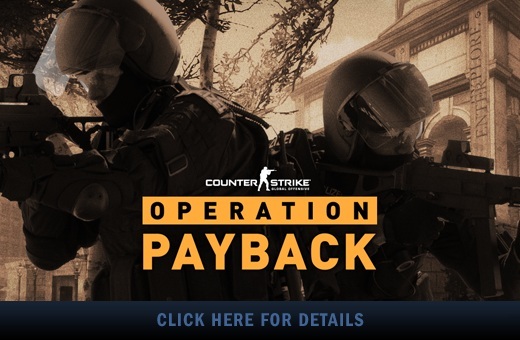 Save 50% on Counter-Strike: Global Offensive as part of this week's Weekend Deal*!